John H. Marbold was the founder of the Marbold Farmstead. He was born as Johann H. Wernsing on May 7, 1800, in Wulften, Province of Hanover, Germany. In 1820, he was adopted by his aunt Catherina Marbold, who had married the brother of Johann’s father. Both Catherina and her husband had taken on the surname of Marbold after acquiring the Marbold Estate at Badbergen, Province of Hanover, Germany. Catherina and her husband had no children, so after her husband died, the Marbold estate was subject to seizure by the government, if Catherina died with no legal heirs. So nephew Johann was chosen to become the beneficiary of the estate with the provision that he assume Aunt Catherina’s surname. Thus, Johann H. Wernsing became John H. Marbold and heir to the substantial Marbold Estate in Hanover, where he prospered. On November 3, 1829, John married Marie E. Sherborn who was born February 2, 1809. They became the parents of six children, three of whom died at relatively young ages. In September 1843, Marie died, leaving John inconsolable with grief. He never remarried during the next 49 years of his life. In 1846, John’s brother, John W. Wernsing, returned to Germany from Petersburg, Illinois where he had established a successful dry goods store. With his brother’s urging, John Marbold decided to immigrate to Menard County. He sold the Marbold estate to his youngest brother, George F. Wernsing. It has been reported that the Marbold estate remains to this day in an excellent state of condition and is owned by family descendants. ​​Thus, in 1847, John Marbold and his three children traveled by vessel to New Orlens, continued up the Mississippi River by riverboat, thence to Elkhart, Illinois by stagecoach, and finally to Petersburg by oxcart. John and his family lived in Petersburg for about three years. 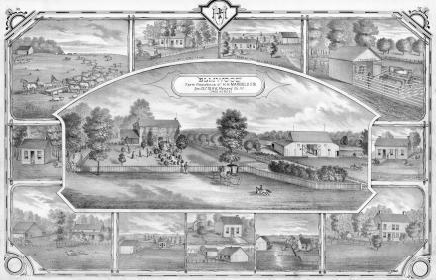 He then purchased two hundred acres near Greenview, which became the Marbold Farmstead, and immediately began construction of the impressive home that would become Elmwood. John H. Marbold had four brothers, two of whom had connections to Menard County: John W. Wernsing and George F. Wernsing. John W. Wernsing was born January 12, 1802 in Wulften, Hannover, Germany, and died May 10, 1858, in Illinois. He immigrated to America in 1828 and originally lived in Springfield, Illinois. He first worked in a land office owned by John Taylor. He later formed a partnership with James Taylor, who was the son of John. Together, they opened a dry goods store in Petersburg, one of the first in the town. The business was quite successful and they later built a large brick building on the courthouse square for their expanded store. In the 1880s this building was remodeled for the offices of the First National Bank of Petersburg. In 1845, John W. married Minerva L. Smith, who was born in 1822. Minerva was one of Menard County’s earliest settlers, having moved there with her parents in 1830 at the age of eight. Soon after their marriage, John W. and Minerva traveled to Germany to visit his brothers. As noted previously, John W. urged John H. Marbold to move to America to take advantage of the opportunities there. 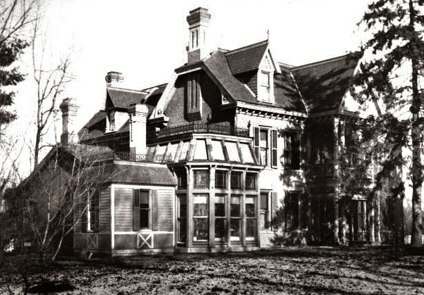 After the passing of John W. in 1858, Minerva married Diedrich Fisher, the builder of Elmwood at the Marbold Farmstead. The Fishers built their own home on a hill in Petersburg, located at 503 Sheridan Road, directly north of what is now The Oaks Bed and Breakfast. After they moved to San Diego in 1892, the Fishers’ sold their home to Henry Schirding, who later became one of the founders of the Schirding State Bank of Petersburg, a predecessor to the current National Bank of Petersburg. George F. Wernsing was born January 30, 1809 in Wulften, Hannover, Germany, and died March 22, 1859 in Germany. He purchased the Marbold Estate in Hannover from his brother, John H. Marbold, before John immigrated to America in 1847. George married Margaretha Ottmann on April 26, 1836. Their eldest son, J. Harmon Wernsing was born January 14, 1839 in Wulften, Hannover, Germany, and died October 02, 1911 in Illinois. He immigrated to Greenview in 1853 at the age of 14. At some point along the way, he changed his name from Wernsing to Warnsing. For several years, he worked as a farmhand on his Uncle John’s Marbold Farmstead. He then began to acquire land and ultimately owned farms totaling over 1,900 acres around Greenview. Harmon’s daughter, Emile Warnsing, married Homer J. Tice of Greenview, who also was the descendent of a German immigrant. Homer J. was a successful farmer and a 40-plus year member of the Illinois House of Representatives. Homer and Emile are the ancestors of the Tice family of Greenview, which included three grandsons who farmed in the Greenview area. Homer W. (1912-1979), the father of, among others, Jerry Tice, a lawyer in Petersburg. Secondly, Evert E. (1920-1975), the father of, among others, Ted, a part-time resident of Greenview and owner of a home that stands on or near the site of Harmon’s home. Thirdly, Bob W. (1925-2005), father of, among others, Bob W. Jr., a member of the Board of the Marbold Association, as well as Terri Tice Little, who today lives on ground once owned by Jerman Tice, father of Homer J. Tice. Harmon’s son, George, inherited and farmed Harmon's ground north of Greenview, near Salt Creek. The ground is owned today by Warnsing descendants. In the later years of their lives, George and his wife Catherine moved to Petersburg and lived in what is now the Branson House Bed and Breakfast. From 1840 to 1880, Germans constituted the largest group of immigrants to America. Many settled in farming communities in the Midwest and, once established, encouraged other family members and friends to join them. Greenview is a prime example. The Wernsings/Marbolds, together with their extended families, were instrumental in the growth and prosperity of the Greenview area. Following is another pertinent example. To put the relationship to the Marbolds in perspective, as regarding Leona Busch Parish (the first person on the above list), John H. Marbold was the brother of the husband of the sister of Leona’s great, great grandmother. Stated alternatively, John Marbold was the brother of Leona's great, great, great uncle. If you have additions or corrections to the above list of Amerkamp descendants, please contact webmaster@historic-marbold-farmstead.org. ​John brought with him to America two daughters and a son. Mary married a Mr. Havinhorst of Havana. Annie married Milem M. Engle of Sugar Grove, now Sweetwater. Milem Engle later became one of Greenview’s first merchants. H.H. 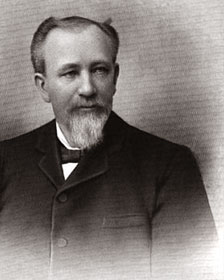 Marbold was born April 21, 1835 in Germany. He was 12 years old at the time of his father’s (John H. Marbold) immigration to America. During his youth, he gained practical experience in farming and cattle trading. He also attended Jubilee College, an Episcopal School north of Peoria. H.H. spoke beautiful grammatical English without a trace of accent, on which he prided himself. He was a big man, about six feet three inches tall, with large hands and vivid bright blue eyes. He was fantastically ambitious and was always busy making money. A Democrat from an early age, he never ran for office, but had something to say about those that did. In 1865, he was named Menard County Judge and reportedly was approached to run for Governor, which he declined. At age 21, H.H. became interested in a young woman, Margaret Hackman, who, in 1856 at age 16, had come to America from Hanover, Germany. She had come with her mother who was a housekeeper for John Marbold. Father John was none too happy about H.H.’s interests in the poor, young uneducated girl. But after H.H. persisted, John sent Margaret to Beardstown to live with a preacher and his wife, both of whom were educated and cultured. After about a year, Margaret returned a posed, soft-spoken lady. H.H. and Margaret were married on June 28. 1860. H.H. was extremely successful, thanks to the profits from the Farmstead, cattle trading and shrewd investments. In 1887 he, together with several partners, opened a bank in Greenview. After several years, he became sole owner of the bank under the name of “H.H. 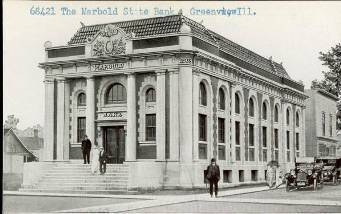 Marbold & Co. Bankers.” He constructed a new building on the northwest corner of Engle and Washington Streets, which is the current location of the Masonic Lodge. In addition to the Marbold Bank, the building housed brother-in-law Milem Engle’s general store. A large upstairs area, referred to as “Marbold’s Hall” in local histories, was used a meeting hall for various organizations and religious groups. In the early days, the hall was also used for dances and other social events. In later days, the hall was used, among other things, as a roller-skating rink. In 1908, construction began on a new bank building which was located on the southwest corner of Engle and Washington Streets. The impressive building was built of stone, brick, marble and tile. The grand opening was on April 21, 1910, the 75th birthday of H.H. Marbold. In 1903, Margaret died and was buried at Rose Hill Cemetery, near Petersburg. At the time, Greenview had no cemetery. In 1904, H.H. 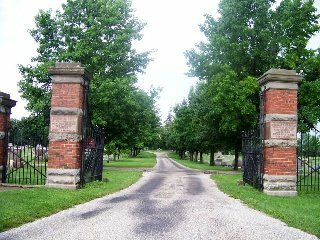 donated a tract of eight acres of land west of Greenview for a town cemetery, now called Elmwood Cemetery. He also erected a beautiful gate at the entrance of the cemetery in memory of his wife. · “Menard Quarterly,” October 1987 and February 1988, published by the Menard County Historical Society, Petersburg, IL.